The Persian- Persians are affectionate and loyal but need their long fur groomed daily. The Maine Coone-Large kitties with a long flowing coat: gentle personality. The Siamese-They like to “chat” with their owners and are very active. The Abyssinian-They’re slim with a shiny coat; very playful and friendly. The Ragdoll-these kitties go limp when picked up, much like a doll...should be kept inside as they are very docile and won’t defend themselves. The Birman-friendly, outgoing, and love to be around humans. The Oriental- a quiet breed and act a lot like Siamese cats. The Sphynx- climbs anything, is and lively and athletic. 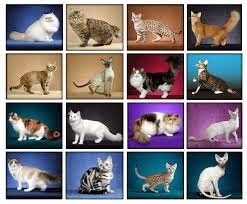 They have no fur, and come in a multitude of colors. Each breed may have genetic predispositions to certain conditions that will need to be addressed in their lifetime, but ALL cats can benefit from good nutrition and supportive supplements to aid in having a long, happy, and healthy life. We have found adding Power Probiotic and using a fish oil like Amazing Omegas will help your cat fight off viruses and supports their overall health.